It can be a great relief when a skin care line has a range of products aimed specifically at the challenges you are facing with your skin. Acne, elasticity, fine lines and wrinkles, rosacea, pigmentation. There is a product line for all of these issues. And if all you have to do is use all the products in the right order a couple of times a day, it seems like a great solution. One benefit is that in most cases these skin care systems work. You will likely be paying a high monthly price for your products but the results are good. A lot of money has been spent ensuring that visible differences are seen, often very quickly. And who can argue with that? If you have suffered with a skin issue that affects your self-confidence, these products can be life changing. However, there is something to be aware of. The reason these products are so effective at changing how your skin looks is that often they are formulated to manipulate how your skin works. This is why you must use the whole “system” and in the right order. Our skin is an organ with processes and functions that it carries out. Sometimes, due to internal or external factors, our skin isn’t able to function well and it shows. One way to remove these physical symptoms is to manipulate our skin into looking good, without removing the root internal or external causes. Science is amazing these days and this is what most of these multi-step skin care systems are doing. Apart from ignoring the fact that there is an imbalance in the body (the skin is a great reflection of what’s happening inside us), the problem will occur when you decide to change skin care. Perhaps because your skin is now looking better and you fancy a change, or because you can’t afford the monthly costs, or perhaps your skin has become intolerant to one of the ingredients and the products are no longer working for you. So, what happens when you stop using the products that have been manipulating how your skin works? Your skin freaks out. Acne and inflammation are most common, oil imbalances are often seen. Your skin has “forgotten” how to function by itself. The sad thing is that often the new skin care is blamed. Quite understandably. Without knowing why, it seems like your skin was fine, and then this new line has caused your skin to break out. It’s a fair conclusion. 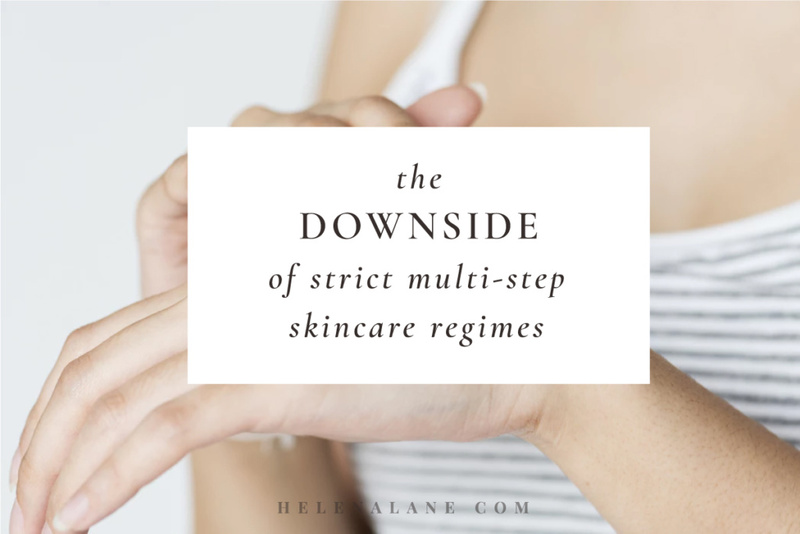 Unfortunately, it can be a difficult process to leave these skin care products behind without having the adverse effects. I have worked with many people to do this and for some it’s a simple transition using very gentle products, but for others it can be a lengthy process to get the skin back to genuine health. One of my main philosophies is to use as few products as possible, this is speaking exactly to this issue of manipulation and dependency. 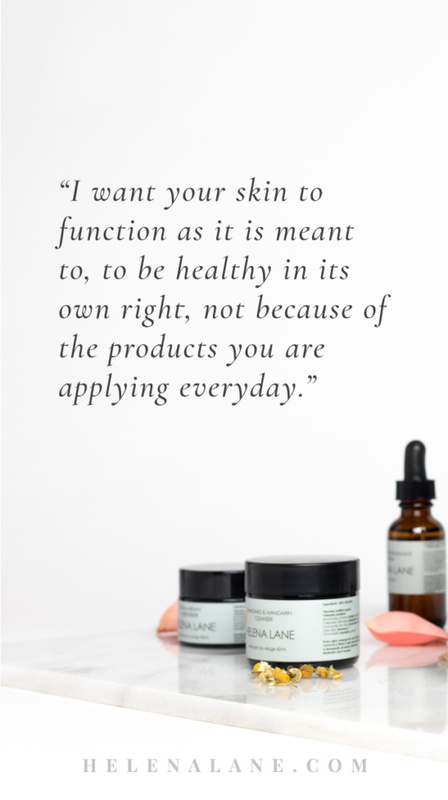 I want your skin to function as it is meant to, to be healthy in its own right, not because of the products you are applying everyday. This also means that if you want to use a product from another company (checking the ingredients first of course) you can without fear of imbalance. And finally, you can let your skin tell you when things internally are not at their best, which is one of the clever functions of our skin. And if your skin is healthy it won’t be too much trouble to get it back to looking good when the internal issue is addressed. I completely understand the appeal of using these products which come with wonderful promises of fantastic results, just be armed with all the information, not just what the marketing tells you. Thank you so much Helena. Your insight in living a clean and healthy life is very inspiring. I really love the way you think and the skincare you have made. It makes the very most sense to me how and what you should be using on our skin. After all we all are organic. With in 2 days of using Helena lane my skin is beautifully polished, glowing, dewy soft, everyday. Helena Lane is the simplest and most effective skincare products that I have EVER USED IN MY LIFE! I am 58 years old. I studied skincare in the mid 80’s and have spent $1,000’s and $1,000’s of $ trying to achieve beautiful skin, with just enough to keep me coming back to the big $, for that look. It was August 2015 I was in a health food store in Campbell River, Vancouver island BC. And found Helena Lane, but it was not selling because people women have bin so misinformed that they do not understand less is more and keep it real! Real meaning organic just like our skin is. Do you think if Helena Lane demonstrate how is works by giving mini facial demo’s, That it would really show more interest. That is my personal opinion. I’m starting to do that this February in Nanaimo with my large female family. I’m excited for I know that I will make a difference for their skin. I also know of a successful business man in Costa Rica. I think it would be really great to have a division of Helena Lane in another part of the world. Thank you for your ongoing support Deborah, I love your ideas!